Charlie Parker: 'Bird Lives!' Part 1 He was a self-taught innovator who used the alto saxophone to change the way musicians would forever speak. He was one of the great improvisers in jazz and together with Dizzy Gillespie, Bud Powell, and Thelonious Monk, he fashioned a new music called "Bebop." Charlie Parker, ca. Aug. 1947. 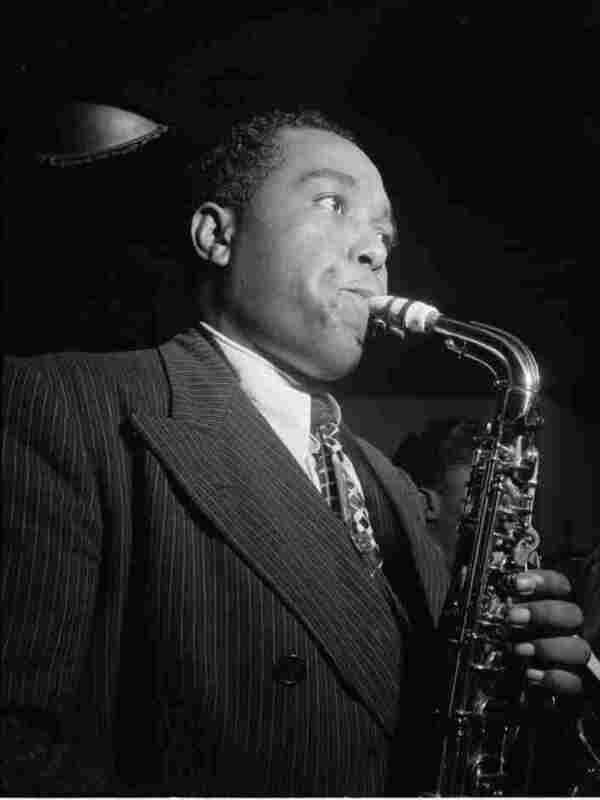 It's safe to say that without Charlie Parker, the music we now call bebop might never have existed. While other musicians in New York — Dizzy Gillespie, Thelonious Monk, and Bud Powell among them — were creating the musical building blocks that would later become part of bebop, it was Parker's innovative phrasing on alto saxophone that provided the glue that brought it all together as a new jazz revolution. In the first of a two-part Jazz Profiles, we explore Parker's formative years and his arrival in New York. Regardless of the velocity or intricacy of his solos, Parker never left behind the basic blues of his hometown, Kansas City, Kansas. Born August 29, 1920, he grew up in the notorious, mobster-ridden town that was also a haven for jazz. His father abandoned his family when Parker was just a child, so his mother worked nights to support the family. This left Bird the perfect opportunity to sneak into the local bars to listen to jazz artists like saxophonists Lester Young and Chu Berry, and trumpeter Roy Eldridge. It's amazing he could think of such complex ideas and execute them and that they could be pulled-off with such clarity, precision, and style. In Kansas City's jazz scene, after-hours jam sessions filled the night air. After gaining a reputation as an aspiring saxophonist, a teenaged Parker joined in a jam session with top-notch players like drummer Papa Jo Jones. The session was far out of Parker's league, leaving the hopeful musician humiliated after listeners laughed at his inchoate playing. In a rare radio interview with fellow saxophonist Paul Desmond and disc jockey John McClellan, Parker revealed that the experience sparked his intense practicing regimen, which often found him playing as much as eleven hours at a stretch. Eventually, Parker began working with Kansas City saxophonist Buster Smith, who according to jazz historian Phil Schaap was known as "Prof" for his work with young musicians. Parker had to travel to New York to find Smith. Upon his arrival he took a job as a dishwasher at a Harlem club called Jimmy's Chicken Shack, where piano virtuoso Art Tatum played regularly. According to writer Gary Giddins, the then-nineteen year old Parker received his first musical vision there in New York. As trumpeter Wynton Marsalis notes, it was from Tatum that Parker first learned how to solo. Whenever he could, Parker played in neighborhood jam sessions and one cold night, in December 1939, he had a musical revelation. When he used higher chord intervals while playing the Ray Noble hit song, "Cherokee," he found that he could resolve the resulting tension with a complex shower of just the right notes. In the words of a Down Beat feature, Parker said that he had came alive. Before his twentieth birthday, Parker returned to Kansas City. He took a job with the Harlan Leonard Band, but quickly left to join pianist Jay McShann's big band. While travelling through Nebraska with the group, Parker hit a chicken while driving and according to McShann, this is where Parker got the nickname "Bird." The band eventually came to New York City to play the legendary Savoy Ballroom. Phil Schaap points out that this was Parker's first real performance in New York City, a significant milestone in the history of jazz. Parker wasn't the only bebop innovator in McShann's big band — Dizzy Gillespie was also in the group. The two horn players had met previously back in Kansas City, when Dizzy was touring with Cab Calloway's big band. In his radio interview with Paul Desmond, Parker recalls the first time he met Diz, while Gillespie reveals how influential Parker's phrasing was on Diz's own playing. After finding a musical soul mate in Dizzy, Parker found himself working with the trumpeter again in 1942, with pianist Earl Hines. Two years later, Bird and Dizzy joined Billy Eckstine's Band, with bebop pioneers such as trumpeters Fats Navarro, tenor saxophonist Dexter Gordon, and drummer Art Blakey; unfortunately, that particular group of musicians folded before recording with Bird. During this time, New York City's 52nd Street was ablaze with jazz, but it was Uptown in Harlem where bebop was on the rise. At Harlem after-hour clubs like Monroe's and Minton's, Bird and Diz played their freshly minted solos at a blistering pace, a clear challenge to the swing-oriented 52nd Street sound. At Minton's, the two friends formed a house band with pianist Thelonious Monk and drummer Kenny Clarke. As jazz historian Stanley Crouch says, "[they] were really trying to find a way to play that was interesting to them"
In January 1945, Parker and Gillespie entered the studio together for first time to accompany singer and trombonist Trummy Young on a song called, "Sorta Kinda." The first landmark bebop recording session took place four months later, when Diz and Bird recorded "Shaw Nuff," and before long Savoy Records came knocking and offered Bird the opportunity to record on his own. When the day arrived, a pianist scheduled for the session couldn't make it and Bird asked Dizzy to fill in. The result is one of Parker's most beloved classics - "KoKo." Gary Giddins describes this song as perhaps Bird's greatest recording, and both "Shaw Nuff" and "KoKo" are now viewed as the birth of recorded bebop. In early 1946, Diz and Bird accepted a two-month engagement at Billy Berg's nightclub in Hollywood. At that time, Parker's heroin addiction was getting as much attention as his musical talent. Dizzy was commissioned to bring a quintet, but he brought seven musicians due to Bird's unreliability. Once the engagement ended, all the musicians returned to New York except for Bird, who cashed in his airplane ticket and stayed in California. Stranded in California with a serious drug addiction, Parker's need for cash led him to Ross Russell of Dial Records. There, Parker recorded four classics: "Moose The Mooch," "Yardbird Suite," "Night In Tunisia" and "Ornithology." Parker's addiction was rapidly debilitating him, and by the time he recorded the "Lover Man," session with Howard McGee, he could hardly stand up to play. After the "Lover Man" session, Parker suffered a nervous breakdown. This led to his arrest, and subsequent treatment for drug addiction at the Camarillo State Hospital, where Parker later wrote a song called "Relaxin' At Camarillo." Six months after this stay at Camarillo, Parker returned to New York with a new vitality. Bird's legacy continues in part two of this special edition of Jazz Profiles.